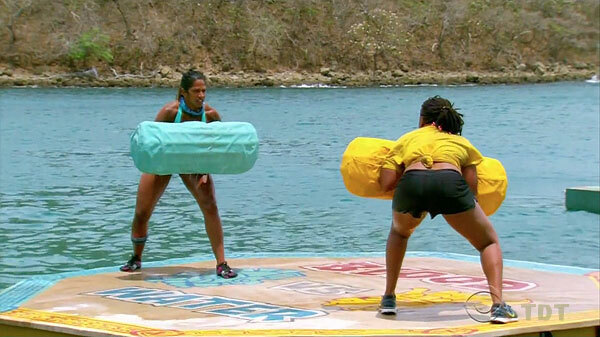 Survivor: San Juan del Sur (2014) - 17th place, 2nd out. 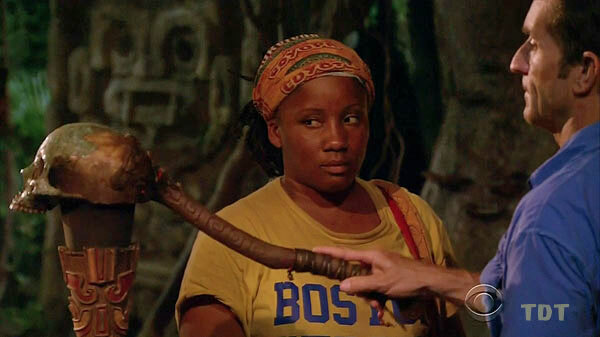 Voted out in Episode 2, "Method to This Madness" (Day 6). Cumulative totals: In-game - 4.5 days; Exile Island - 2 days (1 visit). San Juan del Sur Ep. 1 IC: "Temple of Syrinx" - Participates in the obstacle crawl and climbing, but Coyopa loses. San Juan del Sur Ep. 2 IC: "Sumo at Sea" - Loses in her bout against Natalie, and Coyopa loses again, 5-4. San Juan del Sur Ep. 1 RC: "Man in the Box" - Retrieves one of the two sleds, but loses to Jeremy, and is exiled. San Juan del Sur, Ep. 1: Received an idol clue on Exile Island, but did not find the idol itself. San Juan del Sur, Ep. 2: Pretended to have two idols in her possession. Actually had zero. San Juan del Sur Ep. 2: Four votes, from Alec, Baylor, Josh, and Wes (voted out, 4-4 [5-1 on re-vote]). Now would be a good time to actually have some idols. If he's protecting me, why do I have to play my (imaginary) idol? Yeah, Probst. Baylor flipped on us. Gordon Holmes at XfinityTV.com (10/2/14): "Val - 'I Think Josh Was More of a Mess'"
Rob Cesternino at RHAP (10/2/14): "Exit Interview with the Latest Player Voted Off San Juan del Sur - 10/02/14"
Josh Wigler at Parade (10/3/14): "Survivor Contestant Val Collins Digs Into Her False Idols"
Daniel Fienberg at HitFix.com (10/6/14): "Val Collins talks Survivor: San Juan del Sur"
If You Could Have 3 Things on The Island What Would They Be and Why? 1) Picture of my daughters Jordyn & Camryn to inspire me 2) A lokai bracelet with mud from the Dead Sea to remind me to be hopeful at my lowest point and water from Mt. Everest to remind me to stay hopeful at my highest point. 3) Matching bracelet I share with my kids to feel connected to them. What Does It Mean to You to Play Survivor with Your Loved One? I am excited to play the game with Jeremy but our game will probably be different and that will be hard because I may have to change my game and go against my gut based on his instinct. Playing with a loved one brings emotions to the game right from the beginning. You have to watch their back just as much."